If there is one invention that has evolved massively over a short period of time, it's got to be the bicycle whose precursor was the velocipede (human powered land vehicle)! Because of how far bicycles have evolved, I've always been interested in learning about the mechanical development of bicycles, particularly chainless ones. The advent of the first chainless bicycles was marked by the arrival of the Laufmaschine (a.k.a dandy horse) in the early 1800's. The dandy horse bicycle was truly chainless and it was also true to the term "human powered" as the rider had to quite literary push the bike with their feet on the ground while laying chest-down. 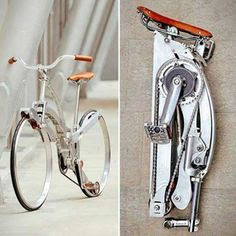 While most velocipedes where chain-driven, the legendary penny-farthing and unicycle where pedal-driven direct drive bicycles, which had their pedals crankset fixed directly to the wheel hub. You will certainly know a penny-farthing (or high wheeler) when you see one because of the huge front wheel and tiny little back wheel. 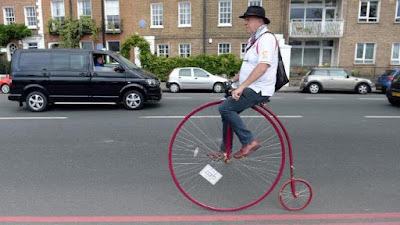 I actually got to see someone ride a penny-farthing in London, and it was amazing how tall the bike really is. The person riding the penny-farthing looked really and truly head and shoulders above everyone (including cars). To this day, I still wonder how he made it safe through London's chaotic traffic. It's also interesting to learn how the penny-farthing name came about. Apparently, it was inspired by two penny and farthing coins laying flat next to one another. Towards the end of the era of velocipedes (early 1900's), the first shaft drive systems for bicycles were conceived. One of the first was the Quadrant shaft driven bicycle (driven by a Lloyd's cross roller gear), which only had one gear. By mid 2000, shaft driven bicycles with more than one gear were made such as the Sussex shaft drive folding bicycle, which had three gears. Shimano's advanced bikes came out in 2009 and they came with 7-speed and 8-speed. A shaft driven system is actually quite simple in design. 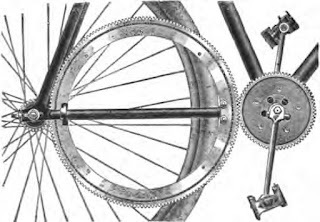 A shaft drive is essentially a mechanical piece that transfers power and in the case of a chainless shaft drive bicycle, it works by transferring power from the pedals to the rear wheel through a combination of gears, a shaft rod and bearings, all housed inside an aluminium enclosure to protect the components from the elements. Unlike conventional chain bikes, shaft drive systems make less noise, offer smoother gear shifting and last longer. You also don't have to worry about greasy and rusty chains as well as bicycle pant clips. Two other classic types of chainless bicycle are the Treadle bicycle and the belt-driven bicycle with a drivetrain. The latter don't use a chain-driven Derailleurs but a timing belt (similar to a timing belt camshaft) to transfer power through a front pedal crankset and a gear bearing mechanism in the rear wheel hub. The Treadle bicycle uses a mechanism similar to a treadle sewing machine and the first of its kind was the Kirkpatrick Macmillan bicycle, which was a rear wheel drive propelled by a foot treadle. Then, there was the Hildick chainless bicycle, which consisted of three different-sized cut gears aligned together to power the rear wheel. There are not many pictures of this particular shaft driven system but judging by the picture abiove, I'm not surprised it didn't catch on at all since it would've chewed up many a trouser leg, among other things! There are certainly plenty of chainless concept bikes out there like the Stigo electric bike and the Sada hubless bike, which folds down to the size of an umbrella. I like the idea but the price tag of $100,000 seemed unrealistic. Luckily, other types of chainless bikes that don't cost near as much have made it to market like the string bike and the hydraulic bicycle. The hydraulic bicycle I heard a lot about for many years but never actually got to see one launched to market until I recently came across someone in Russia by the name of Ziv Brosh who has actually built a proper working hydraulic bike that he'll be launching to market. He calls it ChainFree and it's powered by hydraulic oil and works based on the rotation of a crankshaft connected to a hydraulic pump that builds enough pressure for the rear wheel hydraulic motor to operate. As far as the stringbike, the inventor behind it is based in Hungary and goes by the name of Mihaly Lantos. The Stringbike concept/prototype has been around since 2005 but it was in 2010 when I first saw the first working prototype, which essentially replaces the traditional bicycle chain with a series of levers, pulleys and strings. The Stringbike works by having a lever pivot when pushing down on a pedal, and pulleys attached to the lever go forward pulling the cables with them to propel the back wheel. 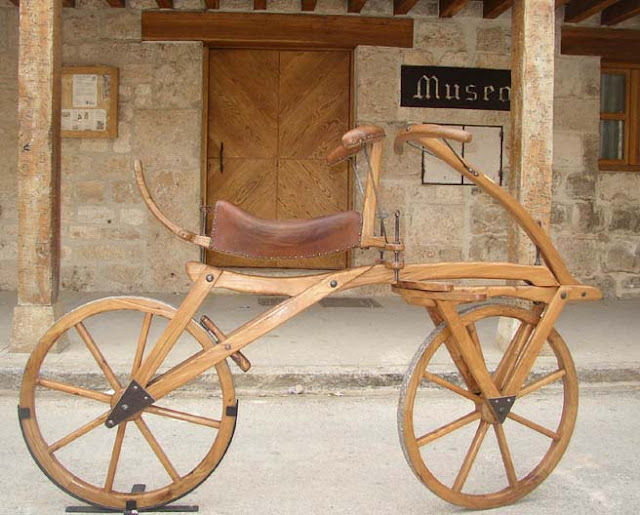 From wooden scooter-like bicycles with no pedals to string and hydraulic powered bicycles, the evolution of the bicycle is surely a fascinating one! I can only imagine how uncomfortable early bicycles without suspension nor pneumatic tyres had to be on cobbled stone streets!